Having a good understanding of modern ball flight laws in golf can help you to self-diagnose your own swing faults – and then quickly correct them. 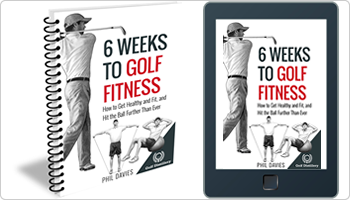 Rather than hitting buckets of balls at the range in the hope that pure repetition will fix that slice or that hook, you can use the direction and the path of the golf ball to give you very accurate feedback about how you’re swinging the golf club. With a quick search, you’ll find a lot written on the Net about “old ball flight laws” versus “new ball flight laws” and how the old laws are completely defunct (despite still being taught by some PGA professionals). 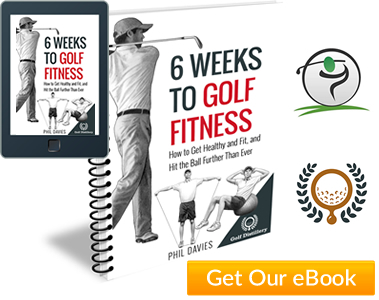 A lot of this information is overly complex – especially for the typical golfer that wants practical advice for improving his or her game. So, rather than giving you an in-depth comparison or complicated analysis, we’ll keep things simple and usable based on our newer, more accurate understanding of ball flight laws. 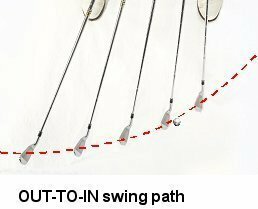 Swing path is the path or direction that the golf club travels during the downswing and through impact with the golf ball. 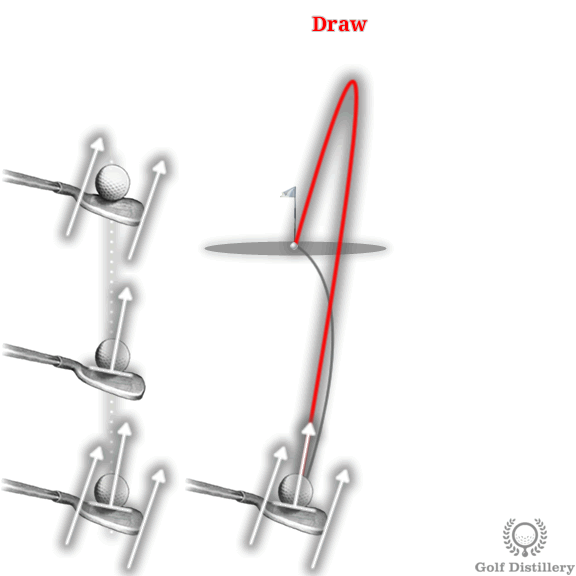 Out-to-in – the club head travels from outside the target line, across it, and then inside the target line. In effect, the path of the club is travelling to the left of the ball-to-target line. 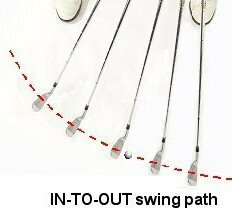 In-to-out – the club head travels from inside the target line, across it, and then outside the target line. So the path of the club is travelling to the right of the ball-to-target line. Straight – the club head travels straight down the ball-to-target line as it makes contact with the ball. 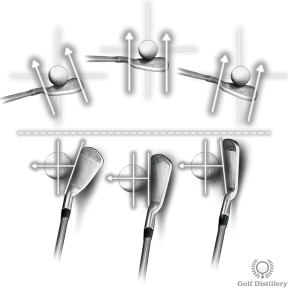 Club face angle simply relates to the direction that the club face is pointing as it makes contact with the ball. When we talk about club face angle it’s always in relation to the path the club is travelling along (swing path). Open – the club face is aiming to the right of the swing path line. Closed – club face is aiming to the left of the swing path line. Square – the club face is pointing directly along the line of the swing path line (i.e. the leading edge of the club head is at right angles to the swing path line). What Causes The Ball’s Starting Direction? Until more recently, it was generally taught that the swing path of the golf club determines the inital starting direction of the ball. So an out-to-in swing path for example, would start the ball left of the target line. 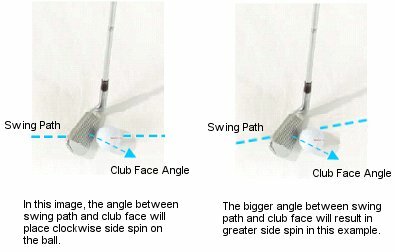 As PGA teaching professionals we knew instinctively that this wasn’t 100% accurate, but it was easy to teach beginners that the “swing path sends it and the club face bends it”.The club face angle, it was taught, then determines whether there is any side spin on the ball, adding curve during its flight. We now know that the club face angle at the point of impact is by far the biggest and most important influence on the ball’s starting direction. Recent data (from launch monitors such as the Trackman and high speed cameras) shows that about 85% of initial shot direction is attributed to the golf club face angle at impact. Side spin on the golf ball is responsible for curving it right or left during its flight (as it does with a slice or hook shot for example). A club face angle that is open relative to the swing path line places clockwise spin on the ball. The more open the club face is relative to the swing path line, the more side spin it places on the ball. And it’s vice versa for a club face angle that is closed relative to the swing path. It places anti-clockwise spin on the golf ball and the bigger the angle between club face and swing path line, the more counter-clockwise spin it results in. Whenever you visit the practice range, make a point of noticing the shape of every shot that you hit. Watching the ball flight gives you instant feedback about the swing you’ve just made – particularly the club face angle and often your swing path as well. If your ball starts left or right of your target but the ball flight is straight (i.e. no side-spin that would curve the ball as well), then you know that the club face angle at impact is nice and square to your swing path. So it must be your swing path that is causing the poor starting direction (ball starting left = out-to-in swing path, ball starting right = in-to-out swing path). If your shots start left of your target and then curve aggressively back to the right (a classic slice) then your club face angle must be open to the swing path line (because of the side spin). But your swing path line must also be severely out-to-in. Why? For the ball to start left of target, the club face must be facing left of target at impact – but to create the open angle between club face and swing path line (which imparts that side spin), the swing path line must be even further left again. What if your shots start left of target and then curve further and further left (called a pull-hook)? Well, again your club face angle must be closed to your swing path at impact – because there is anti-clockwise side spin. But you cannot accurately say what’s happening with your swing path. It could be straight down the ball-to-target line, it could be out-to-in and it could even be slightly in-to-out. Vice-versa holds true for a push-slice (a shot that starts right of target and curves further and further right). Click the chart to open in a new window. 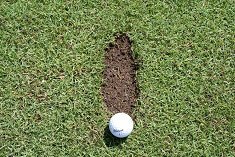 Your divots will tell you everything you need to know about your swing path. A divot that points right of your target line is always the result of an in-to-out swing path. Similarly, a divot that points left of your target line always results from an out-to-in swing path. A straight divot or one that points slightly right of target (in-to-out swing path) is ideal. Set up so that your feet, hips and shoulders aim to the right of your finishing target (i.e. a stance that is closed to the ball-to-target line). This will determine the starting direction of the ball. 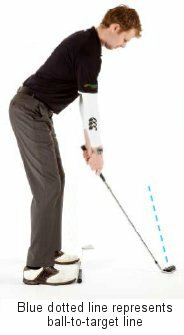 Aim the club face at your target (i.e. square to the ball-to-target line). In effect, the club face will be closed to the swing path. However, “new” ball flight laws from launch monitor data says that the club face angle at impact is mostly responsible for where the ball starts. So in the above scenario, the ball will probably start straight (because that’s where the club face is aiming) and curve left to finish left of our target (because the club face is closed to the swing path). Set up so that the club face is aiming to the right of your target. Swing along the line of your feet, hips and shoulders. The ball will start right of the target (because that’s where the club face and swing path are going) and will curve it back left because the club face is closed to the swing path. 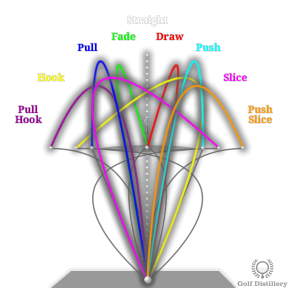 In golf, different ball flight paths are given different names. A lot of amateurs I meet label every golf shot that curves to the right as a slice. But that’s not correct – by definition, a slice must start left and finish right of the target. A ball that starts right and finishes further right is called a push-slice. Is this being pedantic? Not if you want to diagnose and fix your own faults. What might be a suitable correction for a slicer might make a push-slicer even worse.